The origins of First Parish in Lexington date to 1682 when the 30 families then living in Cambridge Farms (the area now known as Lexington) petitioned the Great and General Court of Massachusetts to be allowed to establish their own parish. Heretofore, the residents were required by church covenant to attend worship services at the church on the Common in Cambridge, an arduous journey especially in the cold winter and muddy spring. In 1692, the General Court granted the community the right to establish their own Parish and the first Meeting House was built at the fork of the road just behind the current Minuteman statue on the Lexington Green. And in 1713, the town voted to build a second, larger Meeting House on the Common and Lexington was incorporated as a distinct town. The parish and the church were now a single self governing entity. Rev. Jonas Clarke, ordained in 1755, was a major voice encouraging the parish to resist British rule. In the famous words of Rev. 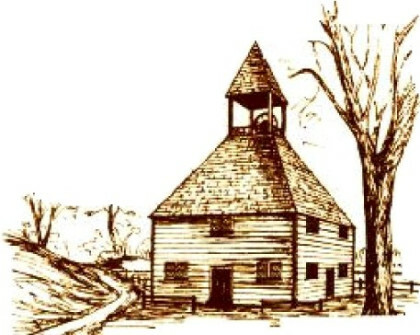 Clarke to his parishioners, “We shall be ready to Sacrifice our Estates and everything dear in Life, Yea & life itself, in support of the common cause.” And so it was that on April 19, 1775 the first shots of the Revolutionary War were fired near our Meeting House on Lexington’s Green. 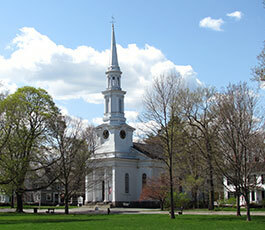 In the 1800’s a third, even larger Meeting House was built on the Green in the same location. In this Meeting House, the parish voted to become Unitarian although the church was still called the First Congregational Society or the Lexington Congregational Society. It did, however, remain the only church in town until a second Unitarian church was formed in East Lexington in 1833. When a fire completely destroyed this Meeting House during the mid-1800’s, the church decided to rebuild away from the public ground as Massachusetts had separated church from state by then. And thus “the white church” was built opposite the Lexington Green in 1847. It stands here today, familiar to millions of visitors to Lexington’s historic center. In 2017, First Parish in Lexington will proudly celebrate its 325th anniversary. More details of our long history are available here.